When I heard that a top favorite duo was coming out with a new book, the first thing I did was immediately add it to my good reads TBR MUST READ list. Then the cover was revealed and OMG, I absolutely love it. It is simply stunning. I did not read the blurb or anything else because I wanted to go into the story completely blind. Erin Watt. Never. Disappoints. Due to the fact I went into this book completely blind, I had no idea what to expect other than I knew it would be an awesome read because HELLLLLLO ERIN WATT wrote it. It was nothing like what I expected, which is a great thing. I love being continuously surprised by an author. The book is about Oakley, aka Oak, Ford which had a pretty successful career as a teen star. However, now that he's more older, he wanted to change his tune and produce something a little more mature/serious. He is advised to date an average girl and so that's exactly what he does. Vaughn, said average girl, is kind of in a hard spot financially so even though she wouldn't normally go for the famous type, she decides to jump on the option to date Oak when given the chance. 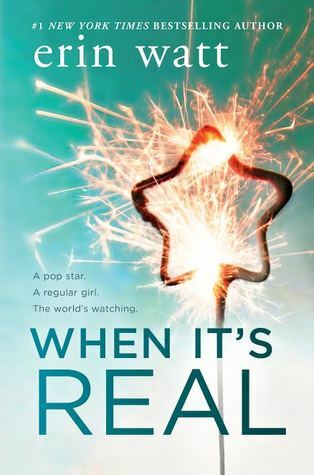 I really enjoyed reading this book, it wasn't as angsty as the previous books I've read by Erin Watt but I did like how fun and sweet this story was. I wanted to smack the crap out of Oakley in the beginning but he really grew on me the more I read the book. Vaughn tried my patience a few times also but I like her character as well. I felt the story was written really well and the character development was on point. I LOVE the deep connection that develops between Oakley and Vaughn. I'm rating this story 4 stars because I really loved the book and it was a quick, fun read. Erin Watt is a duo that I would one click anytime they write a book. I am seriously obsessed.